Photo by Brandon Macz: The Student Conservation Association has been a longtime partner with the Arboretum Foundation. Teaming up with the foundation once again will be the UW Botanic Gardens, Seattle Parks and Recreation and the Student Conservation Association. 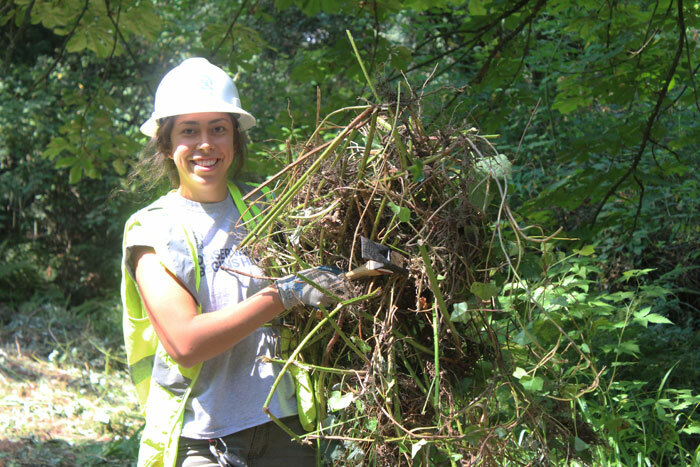 Volunteers will be spread out into around 10 stations all across the park, removing invasive species and brush, mulching, weeding and maintaining trails. Click here to sign up. The Earth Day work party will start with a meet-up at Crabapple Meadow, just south of the Graham Visitors Center in the Washington Park Arboretum, 2300 Arboretum Drive E., where volunteers can grab coffee provided by Fremont Caffe Ladro and the Madison Park Starbucks while they learn more about the participating partners. It will conclude back at Crabapple Meadow at 1 p.m., where volunteers can learn more about the arboretum and its programs. Volunteers are asked to wear long pants, closed-toe shoes, and to bring a reusable water bottle. Project materials and gloves will be provided.